Are you starting a new business or looking for a business advisor for your existing small business? At Denegri & Associates, a Sonoma County CPA firm, we have the experience needed to get your business started on the right track. We provide small businesses with a wide variety of Incorporation and LLC services including business plan development, entity selection, new business advisement, tax planning and more. It's important to seek professional advice when starting a new business in the Sonoma County area. Because each type of business formation has different tax implications for businesses and their owners, it's important to choose the right entity for your needs. If you're ready to discuss your new business advisement options, give us a call today at (707) 546-1484 to schedule your free initital consultation. New Business Advisor. 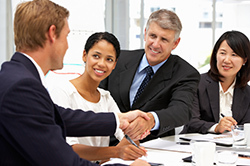 Denegri & Associates provides the knowledge you need to get your business started off right. Strategic Tax Planning. One of the biggest determining factors of incorporating are the tax implications. Denegri & Associates will work with you to develop a plan to minimize tax liabilities. Business Plan Development. Every business needs a plan and Denegri & Associates can help you put yours together. Federal and State Tax ID Applications. Denegri & Associates provides the know-how to easily complete applications for Federal and State Tax IDs. Want to learn more about our Sonoma County incorporation services? Call us at (707) 546-1484 to schedule a free initial consultation.